An is a device which is used to change the orientation of a directional antenna. 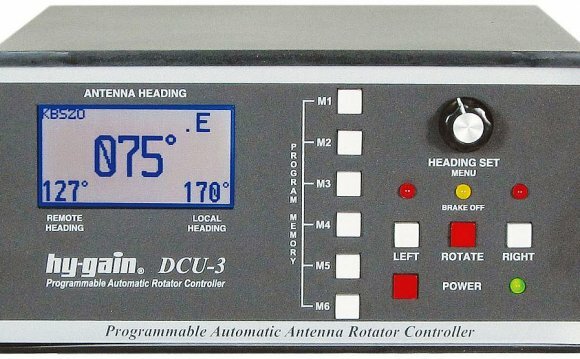 Most antenna rotators have two parts, the rotator unit and the controller. The controller is normally placed near the equipment which the antenna is connected to, while the rotator is mounted on the antenna mast directly below the antenna. Rotators are commonly used in amateur radio and military communications installations. They are also used with TV and FM antennas, where stations are available from multiple directions, as the cost of a rotator is significantly less than that of installing a second antenna to receive stations from multiple directions. Rotators are manufactured for different sizes of antennas and installations. For example, a consumer TV antenna rotator has enough power to turn a TV/FM or small Ham antenna. These units typically cost around US$70. Heavy-duty Ham rotators are designed to turn extremely large, heavy, high frequency (shortwave) beam antennas, but cost hundreds and possibly thousands of dollars. As seen in the center of the reference picture, we can see an AzEl installation (abbreviation for Azimuth/Elevation). It is a rotator type that can control the azimuth and also the elevation direction of an antenna system or array. This type of antenna configuration is use in Amateur radio satellite or EME communication for example. Amateur Radio Antenna rotor running.